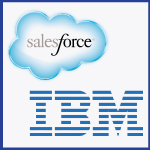 Via Wall Street Journal: IBM, Salesforce Deals Reinforce Cloud Perceptions according to Michael Hickins, Editor of CIO Journal. The high premiums built into Saleforce.com Inc.’s $2.5 billion acquisition of ExactTarget Inc. and International Business Machine Corp.’s $2 billion purchase of SoftLayer Technologies Inc. illustrate the growing importance of cloud services, particularly to business users outside the IT department. Cloud applications such as these are proliferating throughout organizations, often without the knowledge or blessing of CIOs Gartner Inc. has predicted that by 2017, chief marketing officers will have larger IT budgets than CIOs, but that doesn’t absolve CIOs from the responsibility of securing corporate and customer data, and of helping their companies make the most of their technology investments.